The angel of the LORD came and sat under the terebinth in Ophrah that belonged to Joash the Abiezrite. While his son Gideon was beating out wheat in the wine press to save it from the Midianites, the angel of the LORD appeared to him and said, “The LORD is with you, O champion!” Gideon said to him, “My Lord, if the LORD is with us, why has all this happened to us? Where are his wondrous deeds of which our fathers told us when they said, ‘Did not the LORD bring us up from Egypt?’ For now the LORD has abandoned us and has delivered us into the power of Midian.” The LORD turned to him and said, “Go with the strength you have and save Israel from the power of Midian. It is I who send you.” But Gideon answered him, “Please, my lord, how can I save Israel? My family is the lowliest in Manasseh, and I am the most insignificant in my father’s house.” “I shall be with you,” the LORD said to him, “and you will cut down Midian to the last man.” Gideon answered him, “If I find favor with you, give me a sign that you are speaking with me. Do not depart from here, I pray you, until I come back to you and bring out my offering and set it before you.” He answered, “I will await your return.” So Gideon went off and prepared a kid and a measure of flour in the form of unleavened cakes. Putting the meat in a basket and the broth in a pot, he brought them out to him under the terebinth and presented them. The angel of God said to him, “Take the meat and unleavened cakes and lay them on this rock; then pour out the broth.” When he had done so, the angel of the LORD stretched out the tip of the staff he held, and touched the meat and unleavened cakes. Thereupon a fire came up from the rock that consumed the meat and unleavened cakes, and the angel of the LORD disappeared from sight. Gideon, now aware that it had been the angel of the LORD, said, “Alas, Lord GOD, that I have seen the angel of the LORD face to face!” The LORD answered him, “Be calm, do not fear. You shall not die.” So Gideon built there an altar to the LORD and called it Yahweh-shalom. The Lord speaks of peace to his people. I will hear what God proclaims; the LORD–for he proclaims peace To his people, and to his faithful ones, and to those who put in him their hope. Kindness and truth shall meet; justice and peace shall kiss. Truth shall spring out of the earth, and justice shall look down from heaven. The LORD himself will give his benefits; our land shall yield its increase. Justice shall walk before him, and salvation, along the way of his steps. Peter certainly meant everything. In the early days of Jesus’ mission, Peter had gotten to know Jesus with his brother Andrew, and had followed Jesus along the way as He taught. After a while, they returned to their lives as fishermen. One afternoon, as they were bent over their nets, Christ approached them and called them once and for all. “Come, and I will make you fishers of men.” They did leave everything—their homes, their families, their land—for Jesus and for the sake of the Kingdom. I used to experience much confusion upon reflecting on this Gospel, but as I have prayed about it over the years I have come to see that what Christ calls us to here is a lack of attachment. 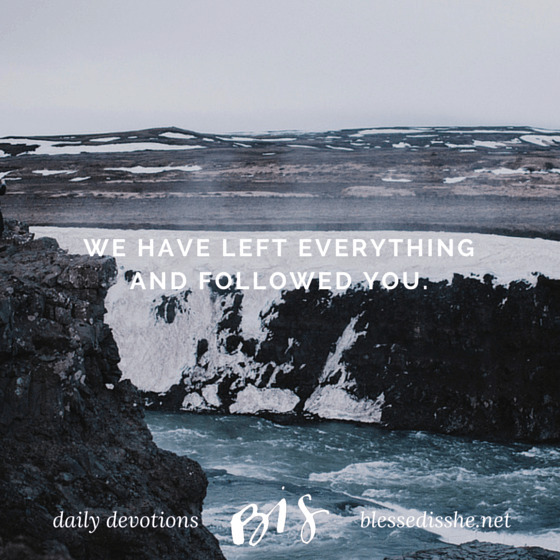 He calls us to be so unattached from our worldly possessions, our families, our careers—that if He calls us to something else, we are willing to go. In my own life, He called me out of my journalism career into ministry a few years ago—although it was challenging to give up something I loved so much, I knew I could not hesitate for a moment to “put down my nets” in something I had studied and worked so hard to achieve. I know now that my career in ministry is far more fulfilling than my journalism career ever could have been . . . I see every day the manifestation of Christ promising one hundredfold if we are willing to let go. In all cases we are called to be willing to let go of what we love for the sake of following Jesus in order to receive this hundredfold of what we have left behind. When Christ calls us away from something, when Christ calls us to let go of something we love . . . it is always for something better. Always. No exceptions. Christ calls us to be attached to Him and Him alone. To what are you attached? Who would you be unable to leave for the sake of Christ? What big or little things come before your God? When Christ calls us to let go of something we love… it is always for something better. Look into your heart and find what you are more attached to than Christ. Perhaps it is even the little things—you are more attached to checking e-mail than praying to begin the day or more attached to making sure you drive by Starbucks rather than the adoration chapel. Challenge yourself to put Christ in the place of that attachment today. Emily Wilson planned her whole life to become a sports reporter but turned out to be a Catholic musician and speaker at the hand of God. She lives out of her suitcase and travels across the world speaking to people of all ages. The heart of her ministry is offering encouragement to teen girls in search of their true identity, and she loves ever second of it. You can find out more about her here. Next Post Where's the Justice?